ATR Vegas Expansion brings new jobs, now hiring! 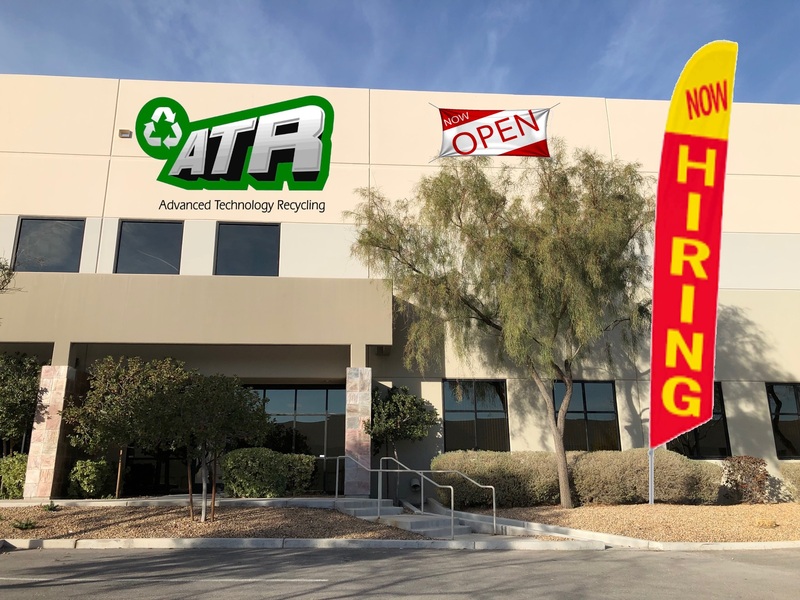 January 28, 2019 Las Vegas NV, Advanced Technology Recycling (ATR) announced today the opening of their 9th location bringing with it immediate openings in all departments. ATR a global leader in sustainable ITAD solutions and Secure Destruction services has successfully opened up the 9th location in Vegas and we’re hiring! The new facility which is located at 4120 W Windmill LN, Suite 105, Las Vegas, NV 89139 is strategically located near the US 15 and the Highway 160 Interchange. This is the 3rd major expansion in the past year for the nationwide electronic recycling and ITAD management company. The ATR Las Vegas facility is currently taking applications for a number of positions, current job postings and descriptions can be found here. In the coming months the ATR Vegas location will be equipped with all the necessary infrastructure to manage customers most sensitive electronics while they monitor the entire progress in real time. The ATR Vegas facility will also enhance logistics capabilities and all trucks will be equipped with the latest Electronic Logging Devices (ELD) that show fleet vehicle locations throughout the US. The new facility will be equipped with portable shredders and remote inventory devices that allow staff to perform a wide range of services at the customers locations. The site will also manually de-manufacture a wide range of electronics to maximize the recovery of reusable components and raw materials for recycling. Our GSA schedule provides special pricing to Federal Agencies and we provide free asset reports through our FIPS 140-2 compliant portal. ITAR Registration allows us to provide secure destruction and recycling services to a wide range of sensitive devices. ATR Las Vegas is actively hiring for a number of positions including general warehouse, office positions, drivers, account managers, and skilled technical jobs. ATR offers a competitive salary package that includes Profit Sharing, 401K, Health Insurance, optional Dental and Optical coverage. ReThink Electronic Recycling and Think ATR ITAD Management!